Songwriters add a new creative dimension to their hobby. You could be practicing at your piano, trying out a bluesy progression in G, or plucking a fingerstyle riff in dropped D tuning on your guitar, when suddenly you get that feeling. Perhaps the chord progression has pulled an image from your memory; or Maybe a phrase you�ve been walking around with fits the riff you�re plucking. Either way, you�re sure it�s a breakthrough�this could be the beginning of an original song. Many amateur musicians play for years before it ever strikes them to write their own songs. The fulfillment a songwriter gets from completing a composition can be as magical as the inspiration that began the process, inspiration that can come from an array of sources, from work to literature to faith. However mysterious the beginning of a song, or marvelous the end product, it�s important to remember that there�s plenty of work, no less fulfilling, in between. 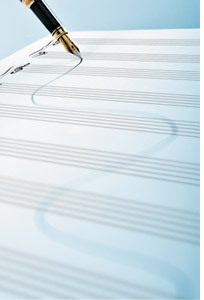 Songwriting is more than just expression, it�s a craft, like poetry or painting, that can be taught. Luckily, there are a number of programs and workshops available to budding songwriters to help them grow into masters of this craft. Both Manning and D�Amato approach the first stage of the creative process differently. Manning, who began writing songs while fooling with a guitar during a stint in the Air Force, starts by working out chords on a piano. For D�Amato, words usually come first, perhaps while sitting with a pen and a pad of paper. Along with the words come a melody, and then she takes it to the piano to create the music. It�s after this exploratory stage that the lessons learned at a songwriting program come in handy. Listening to words of advice from a mentor or hearing the critical input of other songwriters is a useful step toward creating songs that will touch an audience. Songwriting coach Bill Pere stresses the importance of shaping the raw material of inspiration. This can come in the form of a group oriented workshop or a one-on-one tutoring program. Pere has experience in both forms of instruction. He is the executive director of the Connecticut Songwriters Association, where beginning songwriters can learn the craft in workshops, and founder of the Connecticut Songwriting Academy, in which more experienced songwriters hone their skills, with Pere acting as a tutor. A community workshop for budding songwriters in the Connecticut region. An online reference for songwriters. Lots of resources for those just starting out. However, before taking a song to others, some songwriters might have to overcome the fear of rejection. But opening a song up to critique doesn�t have to be a traumatic experience. In fact, Manning found it relieving to be in a room full of songwriters. He knew they were all there to really listen, something you might not find at home. �You need to have a thick skin, but also the ability to say �I don�t agree with that,�� he says. In fact, age can be a benefit when it comes to writing a song, says Pere. The experience that comes with maturity provides a well of knowledge to draw ideas from. No matter what the source of inspiration, and despite any trepidation, both amateur songwriters agree that creating a song gives a great sense of accomplishment. If you do begin to write your own songs, you may just find that communicating your own thoughts on a deeply emotional level makes your musical hobby even more fulfilling.